RAYMOND -(3 Engravings) Edward IV, Henry VI & Edward V.
RAYMOND, G. - (3 Engravings) Edward IV, Henry VI & Edward V.
(3 Engravings) Edward IV, Henry VI & Edward V. - RAYMOND, G.
Title : (3 Engravings) Edward IV, Henry VI & Edward V..
Map maker : RAYMOND, G.. Size : 9.8 x 6.5 inches. / 25.0 x 16.5 cm. 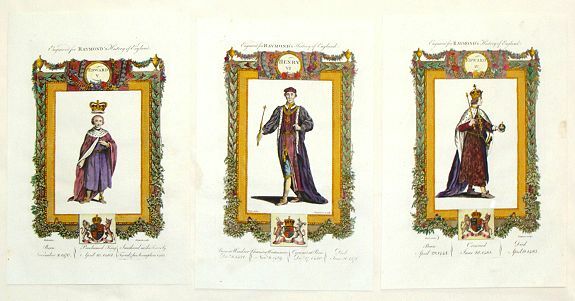 Description :Three hand-colored, copper engravings of three kings of England that reigned during the 1400's. Each has a wonderful printed frame and a royal coat of arms. They are from George Frederick Raymond's "Raymond's History of England". Engraved by Grignion. Condition : In good condition with usual age toning.